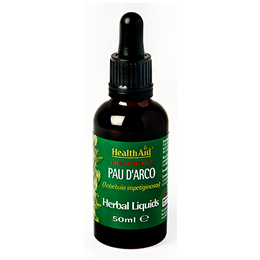 HealthAid Pau D`Arco Herbal Liquid is derived from top quality herbs, those are cultivated without the use of chemicals, preservatives, herbicides, pesticides, fumicides or irradiation to maintain purity. Water, Ethanol, Pau D’ Arco Extract (tabebuia impetiginosa). To reduce Ethanol content, place required amount in hot water and leave for two to three minutes before consuming. Especially micro filtered to provide maximum purity. Below are reviews of HealthAid Pau D`Arco - Herbal Liquid - 50ml by bodykind customers. If you have tried this product we'd love to hear what you think so please leave a review.